One of the prime aims of the Ontario government when it passed the Waste Diversion Act of 2002 was to regulate and secure industry funding for the province’s popular Blue Box program. The deal, a typical political compromise, was for Blue Box financial responsibility to be shared 50/50 between industry stewards and municipalities. The hoped-for results were for the Blue Box to become more efficient and effective; to achieve a waste diversion target of 60 per cent; and to reduce the amount of printed paper and packaging ending up in Ontario homes. At the time, the Ministry of Environment claimed that the industry funding formula would encourage companies to use less packaging or recyclable materials; that stewards would pay lower fees when products were packaged in materials that were easily recycled; and that there would be “less and less non-recyclable materials used in packaging” in the future. Ten years later, we are all much wiser. And many of the fundamental parameters of Ontario’s Blue Box system have changed. Out of necessity, we need to adjust. For starters, we should recognise that the current 50/50 cost-sharing deal is not an Extended Producer Responsibility (EPR) program at all. It is a financial arrangement. True or full EPR means producer (not municipal) control. And if the Blue Box is to be 100% industry-funded in future (as some municipalities would like) then it should also be 100% industry-controlled. Currently in Ontario, industry stewards make financial payments but have little or no control over which materials are collected, or how they are collected and processed. A new financial and operational plan needs to be developed (by the stewards who are paying for it), with the province first providing an appropriate overarching policy framework or direction. If the producers are fully responsible, financially and operationally, then they will be in a better position to reduce the net cost of the program, which has ballooned by almost 70% since 2003. Today, we do have a pretty good idea of how much it costs to collect and process Blue box materials. But there is a growing disconnect between how stewards pay for that (the funding formula) and the changing nature of the Blue Box system and its material composition. improvement (some 73% of it still goes to landfill). And this is the more expensive material to recycle. As well, the advent and adoption by most large urban municipalities of single stream collection, where all materials are thrown together at curbside and sorted out later at a material recycling facility or MRF, has served to downgrade material quality and revenues. The cost for a single stream system is about 30% higher than the traditional two-stream system it replaced, so not only has its introduction contributed to higher net Blue Box recycling costs, it has also meant that some of the resulting commingled materials have been sent offshore rather than being used as a feedstock by Ontario recyclers. The predominant material in the Blue Box used to be old newspapers (ONP), with the highest quality grade (#8) being left on the conveyor belt at a MRF and other materials charged the costs of being separated from it (called a positive sort). Today it’s different. A decline in newspaper sales, coupled with steady growth in corrugated and boxboard packaging (not to mention PET plastic thermoforms), and the widespread adoption of single stream processing, have made it increasingly difficult for MRFs to reduce contaminants and out-throws to meet the quality requirements of # 8 News. Many MRF operators, in fact, are giving up on producing the more valuable # 8 News grade and taking a price hit. The City of Toronto and Region of Durham, for example, no longer request #8 in their processing contracts. These new realities of the marketplace and how MRFs handle them are cogent reasons why the current funding formula needs to be reviewed. At the moment, printed paper and packaging costs are treated separately, in different cost silos. There is also cross-subsidisation between materials in the packaging silo to preserve what’s called a “basket of goods” approach. The problem now, however, is that the nature of that basket has changed significantly, raising the larger question: how, in today’s predominantly single stream Blue Box system, do you properly allocate costs using the old “basket”? In summary, what we have in Ontario is an increasingly expensive Blue Box system over which stewards have little control; major changes in Blue Box composition (less paper and more, and lighter plastics); and greater overall contamination with resulting lower revenues. 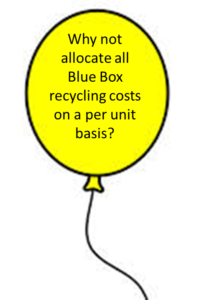 We also have a funding formula that allows cross-subsidisation within the individual silos of packaging and printed paper but not between them (even though all Blue Box materials are now mostly collected and processed in virtually the same way: single stream). We have a suggestion which takes these various market and process changes into account. How about a funding formula that is material-neutral, that does not pit one material against another, and which allocates costs fairly, reflecting the actual effort to recycle it? A unit-based formula. The time and effort taken to process materials as they speed down the conveyor belt in a MRF is relatively easy to monitor. Stewards are already measuring their product sales by the unit, or thousands of units. And Canada’s many deposit programs operate this way as well, basing their fees not on the weight of their packaging, but on their unit cost. 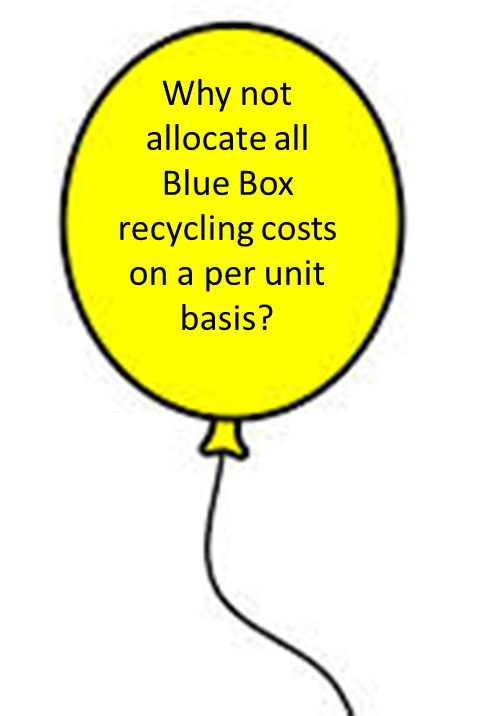 Why not allocate all Blue Box recycling costs on a per unit basis? You don’t have to convert sales to weight and then come up with something as incredibly complicated and outdated as the funding formula we have now. A unit basis is simple and effective. We would urge the Canadian Stewardship Services Alliance (which controls Blue Box program plans in British Columbia, Saskatchewan, Manitoba and Ontario) and Éco-Entreprises Québec (which funds a similar program in Québec) to seriously consider this alternative. It’s time for a change. Ontario MOE, Ontario’s 60% Waste Diversion Goal-A Discussion Paper, June 10, 2004, page 28. PPEC has consistently challenged several of these claims made for the funding formula. How it is intended to work and how it actually works are two different things. For example, PPEC pointed out that zero recovery in many cases was far less expensive for stewards that 60% recovery because the fee structure was so closely tied to the net cost of managing individual materials. Generally speaking, the more material managed, the higher the cost, and therefore the higher the fee. “EPR programs will require producers to take financial and/or physical responsibility for their packaging at the end of the packaging’s life cycle, shifting responsibility away from municipalities.” A Canada-Wide Strategy for Sustainable Packaging, Canadian Council of Ministers of the Environment, October 2009, page 1. The Elephant in the Room, PPEC blog, December 19, 2013. The Blue Box net system cost in 2003 was $117.5 million. In the latest data year (2012) it had reached $198.0 million (Comparison of Stewardship Ontario, Table 2: Gross and Net Costs for 2003 and 2012). Waste Diversion Ontario warned the minister in April 2004: “Given that fees paid by stewards are tied in large measure to the cost of managing each type of material recovered, there is a potential for a growing inequity in the fee rates (italics added) paid by stewards of materials with the lowest recycling rates who could not be making a fair contribution to total system costs” and that “Under the current weighting factors in the formula, those materials with the highest recycling rates … will attract the highest costs.” (WDO response to the minister, 60% Diversion of Blue Box Waste, Material Specific Targets, Municipal Benchmarks, April 30, 2004, Sections 5.2.2 and Section 5.1.2). See also footnote 1 above. Stewardship Ontario Blue Box data for 2003 and 2012 (Tables 1 and 2). Stewardship Ontario Blue Box data (2012). The “basket of goods” approach was adopted by Stewardship Ontario to both preserve the right of stewards to choose the packaging material they wanted, and to reflect the fact that many stewards used more than one packaging material to get their goods to market. The current funding formula does attempt (unsuccessfully in our view) to address the issue that some materials are less costly to recycle than others.